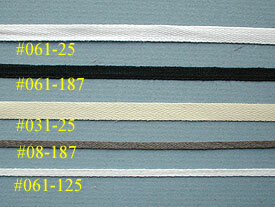 Our selection of narrow cotton lacing tapes are very reasonably priced and perform a thousand tasks, such as reining in shift necklines, caps, spectacles or hair; tying up housewives, longjohns, gathered sleeves or coifs; closing work bags, inner haversacks or breeches; lacing waistcoats or bodices. As stay tape they can be used to keep bias-cut fabric from stretching at the seams, or, under the fold of a jacket or vest lapel, to keep it turned. Or use them for dolls, heirloom sewing projects, conservation or scrapbooking.